Warm for Life provide plumbing, heating and gas services to homeowners, homebuyers in Nottingham and Derby. 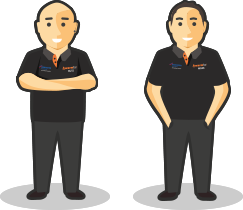 The company is owned and run by Mark Vincent and Russell Bowen, two experienced, Gas Safe Registered plumbing and heating engineers. Warm for Life is one of the few plumbing and heating companies in the UK to have earned this accolade. It’s a mark of our extensive experience and expertise in fitting Worcester Bosch boilers, and proves you can rely on us to do a great job. You won’t hear any about horror stories about Warm for Life! We’re proud of the reputation we’ve built for great service, honesty and value for money. That’s why we’ve invested in Which? Trusted Trader and Checkatrade.com registrations. Not everyone has the cash to buy a new boiler upfront. But we care about our customers and we don’t want anyone going without central heating or hot water. So, to make life easier, we offer 0% Boiler Finance deals to spread the cost of a new boiler over 24 months. providing invaluable peace of mind. We’ll service your boiler once a year, too, keeping it in tip-top condition.